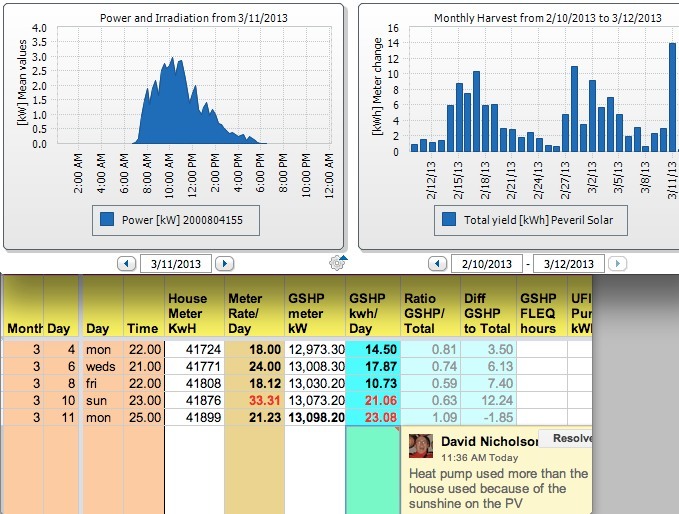 11 March 2013: There are rare occasions (about 5 times a year) when the conditions of temperature and sunshine cause the GSHP to use more power than the entire house - because the house consumption is reduced by PV, and much of the PV power was fed directly to the GSHP. This only happens at Equinoctial times when heating is still required but sunshine can be strong. March 11th was extraordinary because much of the UK woke up to fresh snow and below freezing temperatures. There is a strong cold airflow from the north. There was strong sunshine, with snow flakes falling slowly through the air, and we had the highest PV score since last September. 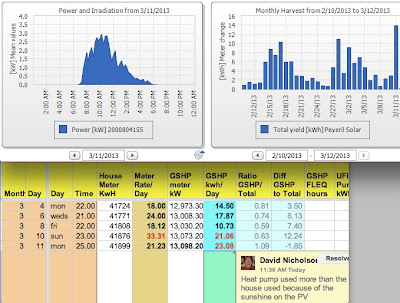 Looking at the meter readings above, you can see that the daily figure for the GSHP is 23.08 and for the house is 21.33. The PV for the day was nearly 14 kWh, and any of that which occurred in the day was fed to the GSHP because it was so very cold! (By the way, if you study the table closely, notice that the consumption for Thurs and Friday was low because we were in Bristol for 24 hours and we turn the heating down). 13th March postscript: The weather conditions are right for this. On the 12th and 13th of March, the same occurred, with the GSHP averaging 25 kWh/day (because of the cold) and the house averaging 21 kWh/day because of the Sun.